First of all, do you like garage sales? My wife hates them. She wouldn’t go to a “garbage" sale if they were giving away gold nuggets. But if you already enjoy wandering from sale to sale, this job will hardly feel like work. Some people like spending a summer Saturday looking for bargains and unique finds. Why not monetize your hobby? Do you live in a target-rich area? Does your neighborhood commonly bloom with sales on the weekend? Can you easily get to a number of spots to shop? Even better if you live in a year-round temperate climate. Up north, garage sales are a summer thing. 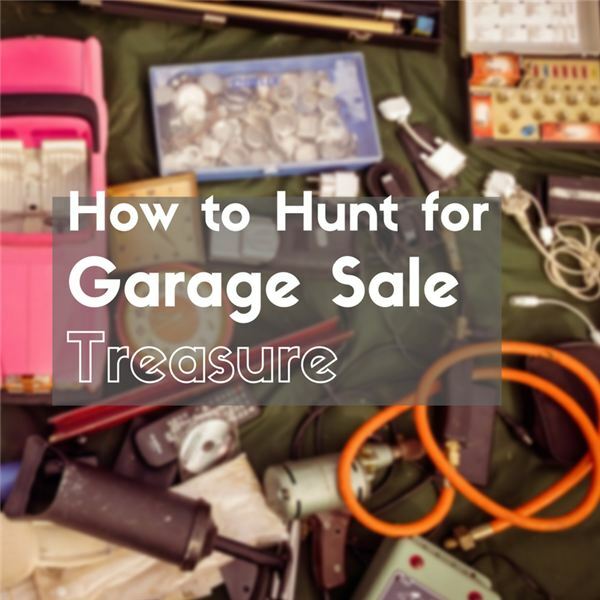 In places where it doesn’t snow, garage sales happen all year. Do you have experience with some of the things you might sell? Knowing your niche is critical. People with knowledge in fashion, electronics, classic music or vintage video games have an advantage. If you don’t know, learn. You need a plan. Wandering around is not businesslike. Create a map of sales you can hit and pick the most efficient route. Plot a course in your phone, but not every sale will be advertised. Be flexible enough to stray from your course to investigate surprises. Read about what each sale has. Some may specifically state vintage clothes, records, tools or games. Do some research on those categories so you know what those items are worth. Apps such as eBay, ShopSavvy and PriceGrabber will help you estimate values of things you find. You can even scan a barcode if the item has one. Try to look subtle, though. Approach the sale casually and not like a cunning buyer trying to flip extra junk for a fortune. This will lower the seller’s defenses and make bargaining easier. Now that you’re prepared, it is time to get to work. Set your alarm because the early bird gets the worm, the Mickey Mantle baseball glove and the mint Atari 2600. Be ready to hit the first sale around 7 or 8 AM. Have a couple hundred bucks on you in small bills. When you haggle the price down from $50 to $20, it’s awkward to ask for change for a crisp fifty. You won’t be the only one at the sale digging for treasure, so be decisive. If you’re not sure if you want an item, carry it around the sale while you look up the value. Don’t turn your back on it. Have boxes and protective packaging. You don’t want to find a valuable vase only to have it shatter in your trunk. Make sure you bring a vehicle that can accommodate a big score. If you think you will snag a table saw or a lawn mower, bring the truck. Don’t be afraid to ask questions. Get the story behind vintage items. It will add value when you sell them later. Have the seller plug in electric items to be sure they work. Look into the battery compartments of electronics and check for corrosion. If you’re hunting for jewelry, bring a scale. You may be selling the items to be melted down. Know the value of gold per ounce and use that to determine your offer. You won’t hit it big every weekend, so keep your expectations low. You shouldn’t rely on this to eat. That takes the fun out of it. Consider it a treasure hunt that could leave you with either fistfuls of gold or sand. What should you look out for? “Anything you can sell for a profit," most hunters say. Truly, you never know what you will run into. Your own experience will make you feel confident in certain buys. Electronics, such as computer components, video games and consoles, cameras, stereo equipment and GPS units. Just make sure they work. Power tools of all kinds. Tires, wheels and other car parts. Clothes, both vintage and new trendy items. Toys. Parents are always happy to clean out closets for cheap. Books, DVDs, CDs, cassettes and records. Musical instruments and PA equipment. Where Do I Sell It All? eBay is definitely the giant in the industry and many experts are willing to share tips. However, you should try multiple sources to see who bites and what works best for you. Amazon is even bigger, but more suited for common items. Craigslist is still a good choice. New apps like LetGo, OfferUp and Swapit get your products in front of a wide range of buyers. Photographing, packaging and selling your items are a huge topic, however. I’ll get into that later. Until then get out there, have fun and score some wonderful finds.